Dovewill Bridesmaid Letter Print One-Piece Monokini Bikini Wedding Bridal Shower Swimsuit - Black, L by Dovewill at SCRHI. MPN: ca3bf212cbbecdb40ca11faca45ee900. Hurry! Limited time offer. Offer valid only while supplies last. 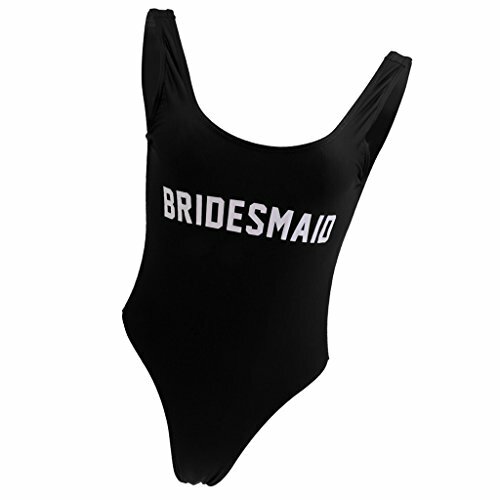 Description:Trendy and seductive look.Special BRIDESMAID letters design printed swimsuit.Has a high leg cut and a cheeky back cut.Good elasticity. Trendy and seductive look.Special BRIDESMAID letters design printed swimsuit. Has a high leg cut and a cheeky back cut. Good elasticity. Runs small. Please order one size larger. Perfect for beach parties, wedding, bridal shower, Hawaiian parties etc. 1.For keeping in the best looking condition, we advise to wash them by hand or use delicate setting in a washing machine. 2.Color might be slightly different due to the color calibration of each individual monitor. 3.Please allow the tiny measuring deviation due to manual measurement.